West End hit musical Wicked is celebrating takings of £100m since it opened in September 2006. The cast and crew of Wicked are celebrating after the musical passed the £100 million mark in box office takings. 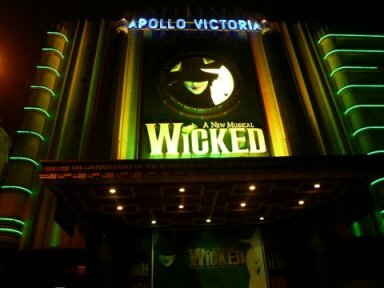 The show has been seen by almost three million people over 1,500 performances London’s Apollo Victoria Theatre, according to its producers. Speaking to the Stage, executive producer Michael McCabe said Wicked is “still going incredibly strong” after nearly four years. Mr McCabe added that the show’s success has been based on “word of mouth”, with audiences growing gradually despite a mixed reception from critics in the first few months. Voted most popular show at this year’s Laurence Olivier Awards, Wicked welcomed Lee Mead to the cast in May. The former star of Joseph and the Amazing Technicolor Dreamcoat is playing Fiyero and has joined Rachel Tucker and Louise Dearman in the Apollo Victoria production. This entry was posted on Friday, June 18th, 2010 at 8:36 pm	and is filed under Uncategorized. You can follow any responses to this entry through the RSS 2.0 feed. You can leave a response, or trackback from your own site.